Discussion in 'TalkCeltic News' started by V For Vendetta, Dec 4, 2018. After a fantastic 2-1 victory over RB Leipzig in the last Europa League game week, Celtic faced a somewhat familiar opposition in Rosenborg BK, 6 times in the last 16 months the two sides have met with the last match ending in a 0-0 draw at Rosenborg earlier this year. Rosenborg who last weekend collected their record 26th league title (Congrats too them) had scored in every home game since the 0-0 draw vs Celtic, so Celtic shouldn’t of been expecting an easy game despite the Norwegian side having lost all 4 Europa league matches so far, many reports suggested Rosenborg would potentially be starting a weaker team in preparation for the Norwegian cup final this weekend, but those reports were wrong as the Norwegians started a full strength side which included the 17 time Ballon Dor winner and recently convicted Niklas Bentner, who had managed to produce Norway’s version of prison break and escape the law to line up against the might of Dedrick Boy… I mean Filip Benkovic. Celtic meanwhile have found there groove again and are in fantastic form, Ryan Christie has become the Scottish Frank Lampard while Callum McGregor has made the deeper central midfield role his own. Celtics wizard of barnets Tom Rogic returned to the starting 11 as Celtic also fielded a strong side with the their baldy captain Scott Brown returning to the bench. 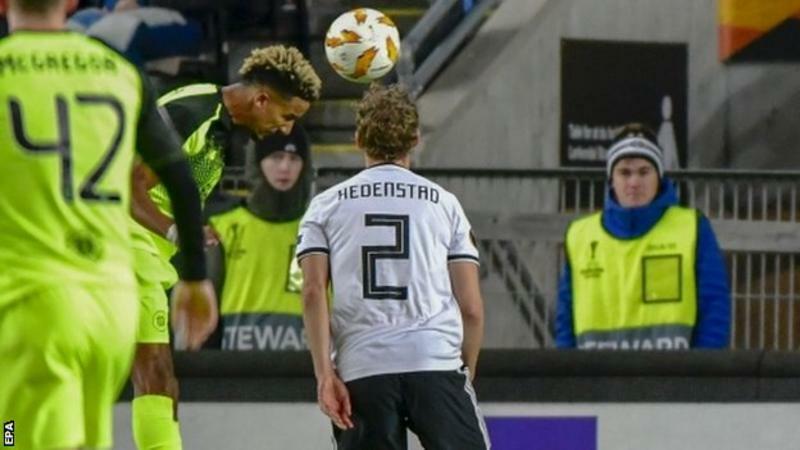 It was a must win game for Celtic with the other game in the group featuring the Energy drink sisters RB Leipzig and RB Salzburg and many Celtic fans had the fear that some funny business would go on there in order for both sides to get through the group. Celtic started brightly and had their first shot on target after 2 min when Rogic found some space in the Norwegians half and sprayed the ball out right to Scott Sinclair, the Englishman had KT marauding past him on the overlap but choose to cut inside and shoot, his effort went straight into the keepers arms but a good start from the Celtic. Edouard kept dropping deep into pockets of space to collect the ball and lay it off too his team mates, this allowed players such as Sinclair and Forrest to come inside with Celtics full backs providing some width, this clever movement has really helped Celtic create chances of late, and the ball found its way to KT around the 5 min mark and his dangerous cross should of really been gambled on by one of his team mates. Celtic dominated possession in the first 10 minutes moving it patiently, Rosenborg set up defensively in a very structured 4-4-1-1 remaining compact and leaving no space down the middle. After some more patient build up from Celtic the ball fell to Ryan Christie who was tackled down the centre of the pitch in Rosenborg’s half but Tom Rogic picked the ball up with options in front of him, the shot looked the best option as Rogic ran towards goal but he tried slipping the ball to Edouard however a Rosenborg defender nipped in brilliantly and stopped the attack. Rosenborg started to get into the game around the 15 minute mark and produced some good football which came to no avail, a quick counter attack saw the ball fall to Tom Rogic who played a lovely 1-2 with Scott Sinclair, Sinclair’s pull back found Christie but his shot deflected out for a corner. The corner was typically woeful from celtic but a deft touch from Rogic opened some space up for the Aussie however his shot was blocked and Rosenborg cleared. The Celtic support were in fantastic voice with a number of Irish songs being sung to the disgust of many Celtic AGM goers and board members who I’m sure were expecting a rendition of sweet low sweet chariot. Celtic retained the ball well in an attempt to draw Rosenborg out there structured shape, however poor individual errors from the Norwegians often gave Celtic their chance in space, it could be said that Celtic were attempting to walk the ball in the net rather than stick there foot through it. Some more good football from KT and Scott Sinclair gave Rogic the chance to cross the ball, Forrest looked to control the ball in a dangerous area but some more last ditch defending from Rosenborg saw it go out for another corner, 20 minutes in and it was all Celtic. Celtic finally forced Hansen into another save on the 23rd min, some good patient play out wide saw a low pulled back played into Edouard who played a deft little touch into Tom Rogic who’s low side footed shot went towards the near post however Norwegian player of the year Hansen tipped the ball round the post. Rosenborg created a good chance just after the half way point in the first half, Scott Sinclair was too Easley muscled off the ball and a dangerous cross came into the box which Nicklas ‘The Jailbreaker” Bendtner probably should of reached and stuck into the net, why he was allowed to get in between Celtic’s centre halves is another matter. Celtic retaliated with two efforts on goal, a tame shot from Rogic and another from Edouard who dragged a shot across the box but it was all Celtic at the half hour mark. Konradson was booked in the 35th min for a late tackle on Christie and some dissent towards the ref, the resulting free kick wasn’t a normal Ntcham into the keepers hands probably because he wasn’t playing but a decent looking training ground move which saw a short ball played into Ryan Lampard Christie who floated ball found Boyata offside but it’s nice to see a new free kick routine. Celtic continued to look the better side and finally broke the deadlock on the 40 min mark, James Forrest found himself 1v1 vs Merling and beat him with ease before floating a superb cross to the back post which found Scott Sinclair who headed home, Sinclair who hasn’t hit the heights of his first season but has been knocking up some goals of late will be delighted, Forrest again showing how me and many who wrote him off before Rodgers reign were wrong. Half time came with Celtic deserving there lead and as Sir Kenneth Of House Miller said at half time we looked in complete control but hadn’t created an awful lot of clear cut chances, however Rosenborg are at home and had to come out in the second half so more space should open up for the Bhoys in black and I think yellow although I’m not sure because I’m slightly colour blind to capitalise. Rosenborg started strongly and some good play in the midfield gave them a chance to get the ball into the box, a good ball in was well dealt with by Benkovic but it was a warning to Celtic that Rosenborg were not going to go down with a whimper. A poor challenge from Denic saw the Rosenborg defender get a yellow card, however James Forrest the recipient of the tackle stayed down for quite some time before getting up to his feet. Celtic started to find their feet in the second half and good runs from KT and then Christie towards the byline saw a good couple of balls come into the box neither leading to shots but the fact the Scottish internationals beat there men so easy down the left was promising. Denic could of then walked on the 57th minute for a second yellow as he fouled the on running Ryan Christie, personally I don’t think it was worthy of a yellow but many will and would it be costly later on in the game? Celtic were still well on top in terms of possession but the clear cut chances evaded them, a good direct run inwards from Forrest around the hour mark almost gave Celtic a clear cut chance but his final ball was well sniffed out by Rosenborg’s defence. Some very good play from Celtic who knocked the ball around the Rosenborg box which had me screaming “* kick the ball towards the net you *” however a clipped Lustig ball towards the back post gave Edouard the chance to line his man up 1v1, he beat him wise ease using the same drop of the shoulder he did Vs Sevco a few months back however his goal bound shot was blocked by Ryan Christie, it was later found out Christie had under 1.5 match goals on BartonBet so well done to him for winning £6.77. Celtic then made a double change Cristian Gamboa came on against his former side replacing the also former Rosenborg right back and captain for the night Mikael the Snail Lustig, while Leigh Griffiths replaced Odsonne Edouard up top, its great to see the thumb return from his most recent injury of erectile dysfunction (I have left a link below for anyone struggling with erectile dysfunction, don’t suffer in silence get some *). Celtic remained on top of the game, but as per most the game they struggled to create clear cut opportunity’s, Rosenborg weren’t threatening too much but it always looked like they had a goal in them. Tom Rogic then thanked his lucky stars he wasn’t playing against Neymar as he stupidly flicked out at Vilhjalmsson after a tussle, while it would have been crazy to send him off nowadays you just can’t flick out like that because people are *. 16 minutes remain and the news came through that Red Bull were leading against Red Bull and if things remained the same then Celtic would only need a point against Red Bull to get through the group stages. Jensen put a well whipped cross into Celtics box which found the head of a Rosenborg player who headed over. Scott brown then came on for the last 13 min for James Forrest, Kieran Tierney sprant over to the touchline and bowed before Brown while handing him the captain’s armband, personally I wouldn’t of taken Forrest off as he was constantly looking a threat but he could of still being suffering from that earlier tackle on him. Going into the final 10 minutes and Celtic just needed to see the game out, it promised to be a nervy finish, the Celtic support as always on these euro away days were still in fantastic voice. Kieran Tierney played the pass of the night when he played a 1-2 with Scott Sinclair, the Scotsman played a lovely outside the foot lofted pass into Callum McGregor but McGregor was cheated out of a corner. Celtic reverted into a compact 4-1-4-1 and began to play with a low block restricting space for the Norwegians to get behind them however it looked like Celtic wanted to give the ball away every time they tried playing it out from the back. The Prof and Mr. Slippyfist like this.